Anyway, today I have one fabulous giveaway for you all! The wonderful folks over at Shabby Apple have kindly offered to give one of you, my lovely readers, a gorgeous necklace from their line! One lucky winner will receive The Duchess necklace, a lovely vintage-inspired cameo on a long chain. Can I just tell you how much I love this piece?! It is so stunning, and you know I have a weak spot for anything silhouette/cameo. 2. Visit the Shabby Apple website and tell me what your favorite piece is. There's so much to choose from, from adorable dresses, to vintage inspired jewelry and cute fitness gear! 4. Like Honeycomb Creative Co. on Facebook. That's four chances to win! How easy is that? And best of all, Shabby Apple is offering 10% off to HCC readers by using the code honeycombcreations10off at checkout! Fabulous! Their stuff is all vintage-inspired goodness, and I know you'll love it if you haven't checked it out already. Contest is open to those with a US mailing address, and it will close Sunday, February 26, at midnight CST. Sorry, no exchanges if you win the necklace. It's yours to keep. Good luck everyone! Liked Honeycomb Creative on FB! I am already a Honeycomb Creative blog follower. I love the Overboard and Toe the line dresses from the Set Sail collection. I'm a sucker for anything preppy and nautical. I'm a follower and I like Shabby Apple on FB! Love the White Rabbit's Timekeeper. such a cool classic! I am a follower of this beautiful blog. Liked everything!! And I love everything from them, and you. My favs are the Gold Bangle Bracelet Set, the Water Earrings, Nuvola Ring, Hyacinth Bag, and any one of the shoes. Love it all. But I have a passion for cameos. I love the Dressage dress! I have been a follower of yours for sometime already. Thanks for the chance..Love all their stuff. 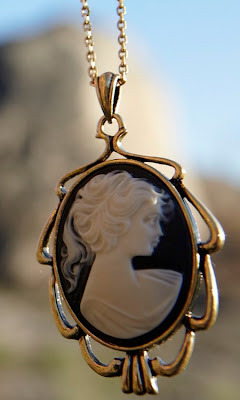 Especially the vintage cameo shown above. Oh my just found their aprons. I love them too! Thanks for the chance.. I've liked shabby apple on fb for awhile! I like the Glowing ruffly flats in blue. Darling! I "Like" Shabby Apple on Facebook as Manda Valenti! I love Shabby Apple's Ballerina dress.